While Denmark had always been on our “Bucket List,” we’d been quick to group it in with the other Nordic countries as simply too expensive to visit in the near future. However, fate, in the guise of two Canadian friends, extended us an offer that we couldn’t refuse: a place to stay, a kitchen to cook in and a list of inexpensive things to do to get the most bang for our buck. It took a mere few seconds for us to glance at each other and start googling air fares. A four-hour bus trip from Lagos to Lisbon was a convenient way to reach the airport and the 3-hour flight to Copenhagen made our rather impetuous decision to visit the city of Hans Christian Andersen seem pretty darn reasonable. We still had that “pinch me, I’m going to Denmark” feeling when we flew over the wind turbines of Middlegrunden offshore windfarm, less than 4 kilometers off Copenhagen’s shoreline, with the skyline of the capital rising up in the background. At the airport, we exchanged some Euros for the Danish Krone, stopped by the tourist information booth to pick up a city map and headed in the direction of the bus stop to catch the 5A bus to our stop, Klaksvisgade-Langebro – our tongues and memories both had a hard time wrapping themselves around the names – and meet our friends. And the location of their sublet apartment (furnished of course in Danish modern with some Ikea influence thrown in) couldn’t have been better, within walking distance to everywhere we wanted to see. Arriving in any city for the first time can be a disorienting blur but a walk about the area our first day gave us a kaleidoscope of impressions to mix with the factoids we’d picked up about this charming city. It’s a city that rightly earns its nickname, “The City of Spires,” and the skyline is dotted with these tapering structures. 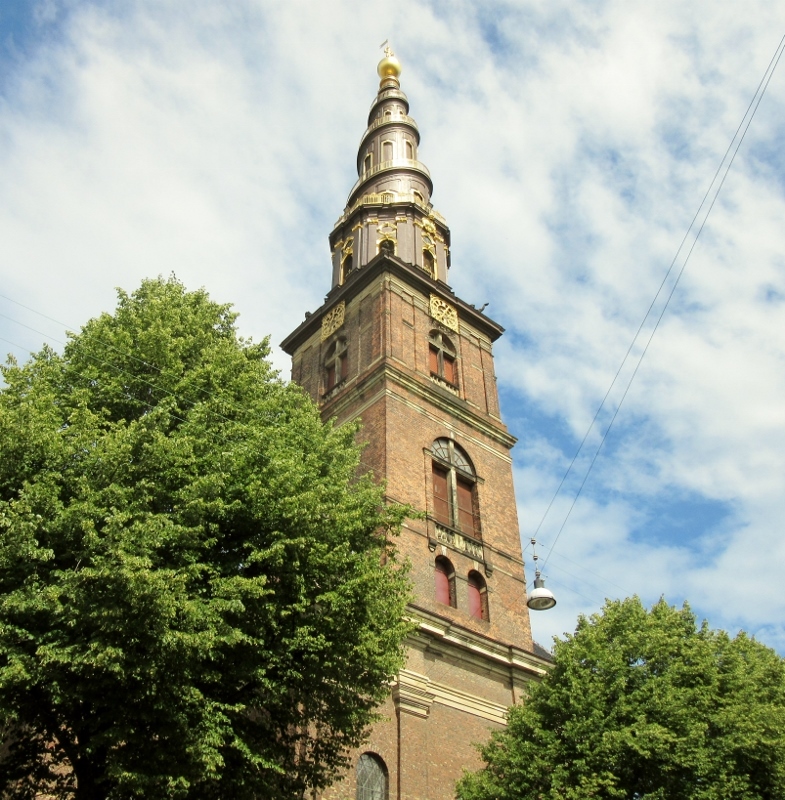 Towers and steeples adorn many of the older government buildings, churches and castles – jutting towards the heavens, silhouetted against the sky. It’s a city with a multitude of architectural influences that mix, contrast and ultimately work together to blend the oldest section of its medieval city with eye-catching and exciting modern architectural designs that have been built since the millennium. The skyline of the historical area is horizontal rather than vertical so that the contemporary architecture doesn’t overshadow the Baroque palaces that mingle with 18th Century rococo mansions along with beauties from the Dutch Renaissance. It’s a city where you’re never too far away from the water. 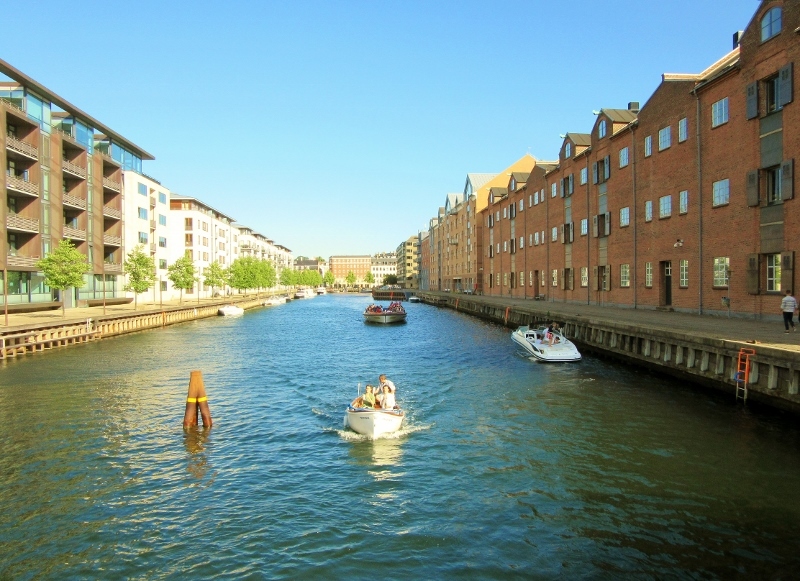 Built on two islands in the Baltic Sea, Zealand and Amager, Copenhagen has eleven bridges spanning seven canals. The water gives the impression that everything has just been washed and, when the sun was out, sparkling clean. It’s a city of wide avenues mixed with one-way streets of cobblestones and pavement. A city where three lanes of traffic means a lane for cars, a lane for bikes and a lane for pedestrians. And that middle lane, the “bike path” was actually one of the most astonishing things to us, hailing from the land where the car is king. Here sturdy bikes, unadorned or topped with baskets or pulling kid-friendly conveyances, rule! 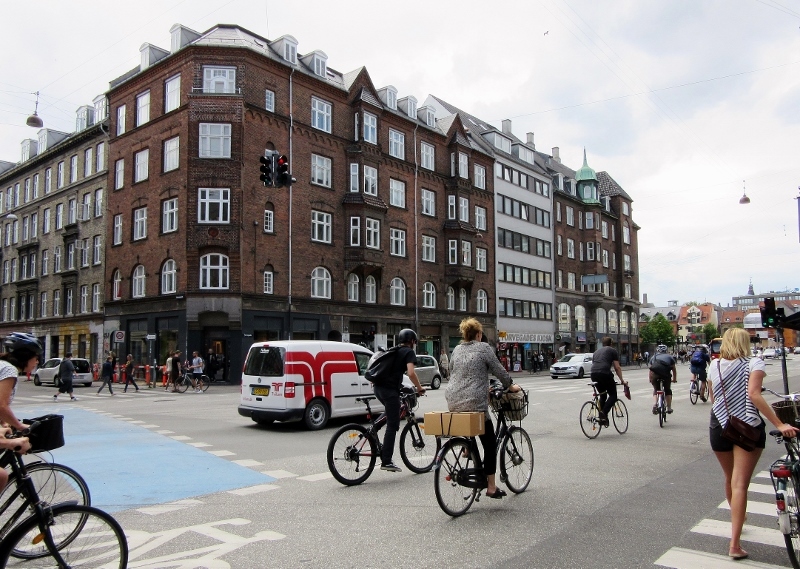 Copenhagen is a city of bicycle super highways and networks of lanes that connect the downtown to its outskirts. 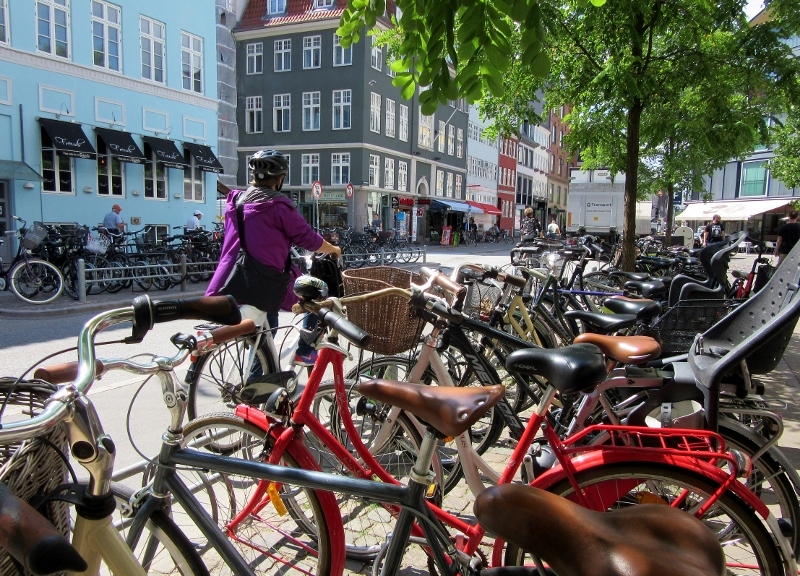 In fact, more than fifty percent of Copenhagen’s residents use the bicycle as their primary form of transportation. It’s a city of changing weather. We changed sandals for shoes and socks, shorts to jeans and carried and donned light jackets as needed. The sky was brilliantly blue one moment, steel-gray the next and during our visit we experienced intermittent sprinkles mixed with downpours and moments of radiant sun. And yet, while we were scrambling to keep up with the fluctuating weather, the residents carried on according to the calendar, wearing the clothes suited for the month to catch the fleeting rays. We even spied some hardy souls swimming in the pools adjacent to the canals, celebrating the short summer. It’s a city where the number of daylight hours in the northern latitude carries a lot more weight than other places we’ve been. The winter solstice has only 7 hours of daylight but our visit was just after the summer solstice, June 20th, and we were treated to a whopping seventeen-and-a-half hours of daylight. Our first night saw us reluctant to end the day but fumbling for dark socks as make-shift eye masks the next morning when the sun rudely awoke us at 04:30. What a wonderful in depth guide to a beautiful city. It was fascinating learning about the history, thanks for finding all this out and sharing. 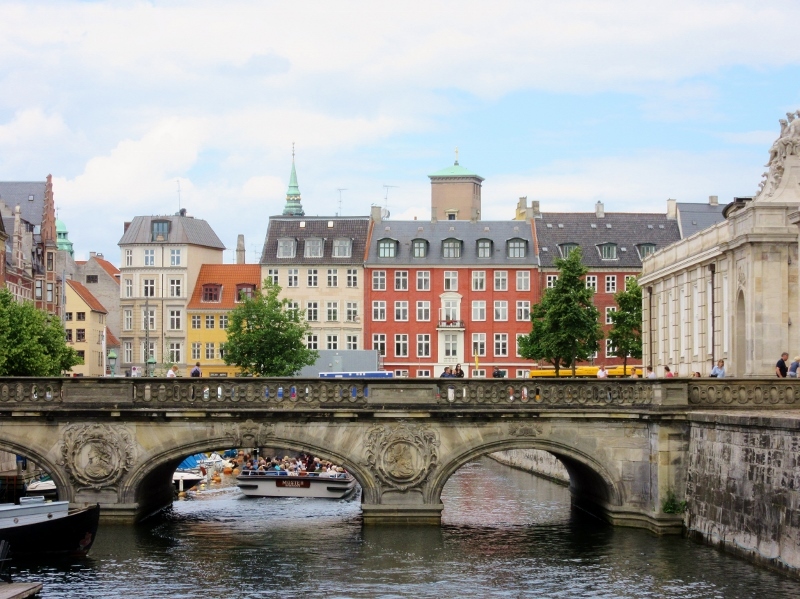 We spent only one day in Copenhagen on a Princess Cruises world cruise, which was fantastic – but only a taster of what Denmark has to offer. Would love to go back. 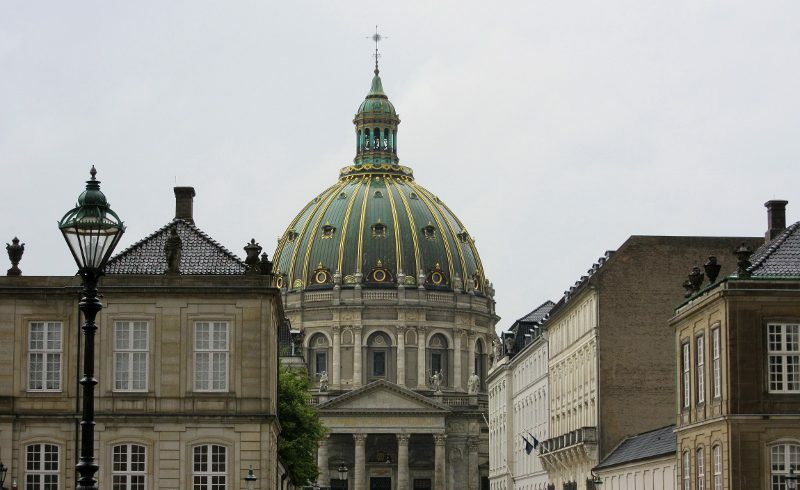 We’re so glad you enjoyed this, Jo and we can second your opinion that Copenhagen is a beautiful city! I especially loved the spirit and energy of the city and its people and how the huge variety of modern and centuries old buildings all blended together to make walking about a wonderful delight. 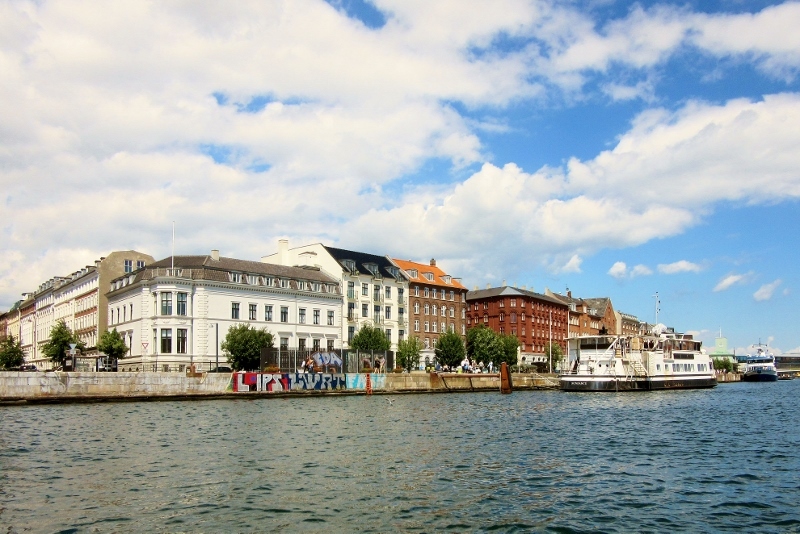 And I’m with you – we’d love to go back, too and explore more of the city as well as venture out into other areas of Denmark. My great-grandparents were Danish so it was a real treat to see their homeland! Thanks! 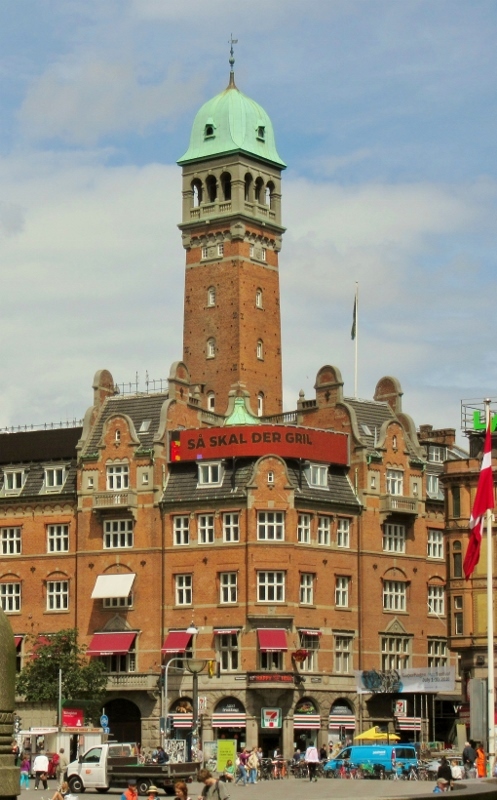 Copenhagen is a great city for amateur photographers. Like you, we loved the fact that the city is bike friendly and it’s not hard to imagine how much money people save every year by not depending on cars. The public transportation system was awesome too. 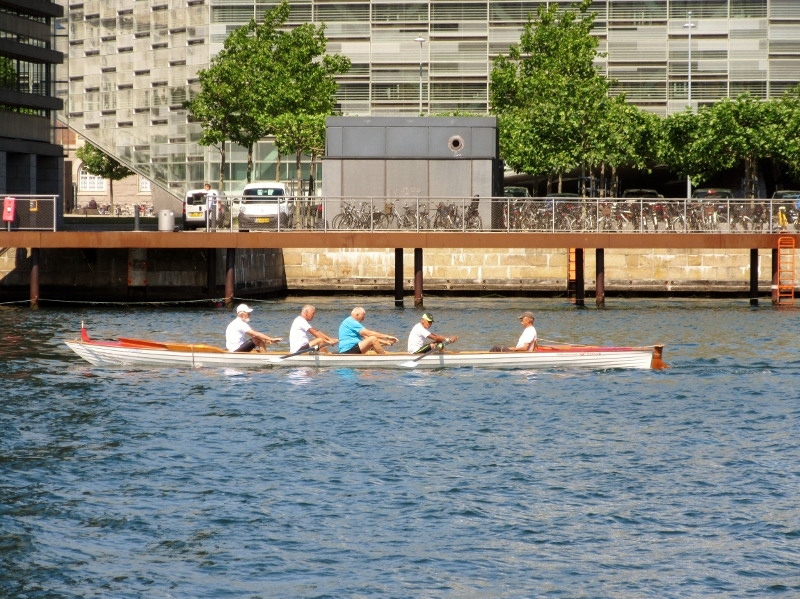 The Danes seemed to be extremely fit and hardy – definitely a good example for the rest of us! We felt healthy just looking at all those happy Danes! I’ve always wanted to visit Copenhagen, but alas my travelling days are behind me now. Still, I’ve enjoyed your photos and overview of the city. One of the best things about the many travel blogs online is the ability to travel virtually via pictures and descriptions of the endlessly amazing places around the world. We have a great time reading about others’ travels and writing about our own (kind of doubles the fun!) 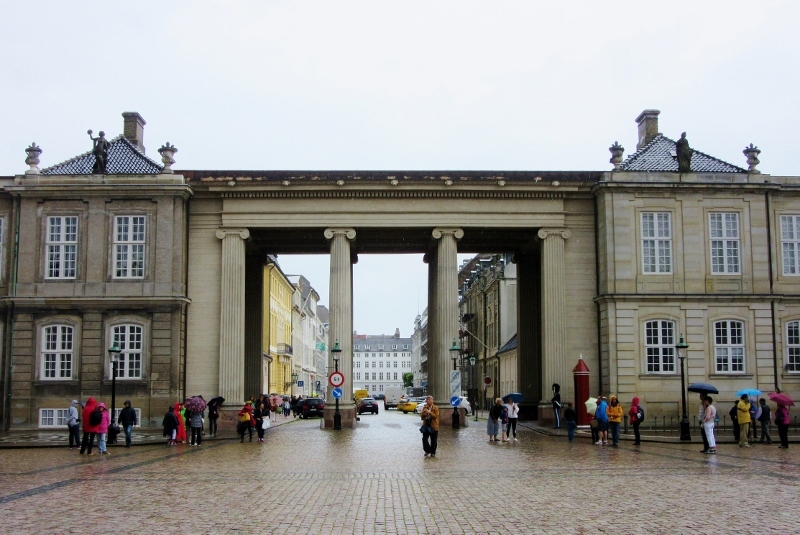 and are so glad you enjoyed this post of Copenhagen and took the time to comment. Thanks! Yes, Yes, Yes! Copenhagen is a lovely city and it didn’t take long for us to fall under its spell nor wish we’d more time to explore it leisurely. We can’t recommend a visit highly enough! I had mixed feelings about Copenhagen. In my search for a “reasonably” priced hotel, we ended up near the train station. As in many other world class cities, some of the underbelly of the city could be found in that area, including aged, burnt out hippies—mostly Americans. I also saw a sign advertising the black Alvin Ailey dance company vandalized with hate speech. Having said that, it was enjoyable to be there. Your photos remind me of the parts we enjoyed. For people who are less diligent than Anita and Richard, the Copenhagen history museum was excellent, but be careful walking around. In some places, the dedicated bike lanes look like sidewalks. I saw one collision and one near miss where tourists thought they were OK on the sidewalk, except it was a high speed bike lane. Our friends were quick to warn us that bikers RULE in Copenhagen and pedestrians beware! So we practiced our swivel head type sight-seeing approach which involves looking up, down and all around and trying not to gawk too much at the lovely buildings, parks and statues. 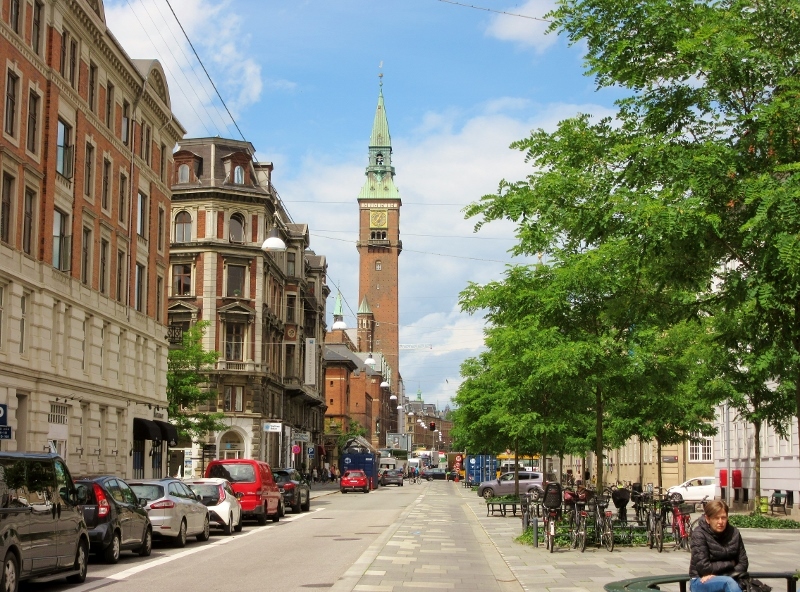 Except for “sticker shock” we had a very positive impression of Copenhagen and, even though we were walked by the train station and around the area, didn’t observe the burn-outs nor any indication of racist defacement to spoil our impression of the city as a place of tolerance. (Lucky us 🙂 ) So glad you enjoyed our photos Suzanne! Great post!! Funny that just last night I watched a documentary about Copenhagen and no need to say I added to my bucket list:) I was really impressed how wide the bike paths are..
Copenhagen’s now on our “Return to… bucket list!” The bike paths really wowed us with the ease that people were able to move around the city as well as the fact that the car traffic wasn’t a mess of congestion. Plus, the riders seemed to be enjoying the activity as well instead of scowling behind the wheel or looking stressed trying to find a parking place! It seemed there were bikes everywhere! It is also a place that is actually extremely “children friendly”.. This I know from friends that lived there for many years. Lovely post with photographs that made me feel nostalgic for a place we spent a tiny amount of time in. Luckily we too had free accomodation, by way of a delightful home exchange, so we didnt feel the huge “sting” of the expense of being there. Maybe Copenhagen proves the adage, “You get what you pay for!” We’ve learned over the years that there are often ways to decrease costs to even expensive destinations but we think we’d have to stick to the high season and avoid the winters ourselves – been there, done that in Montana. 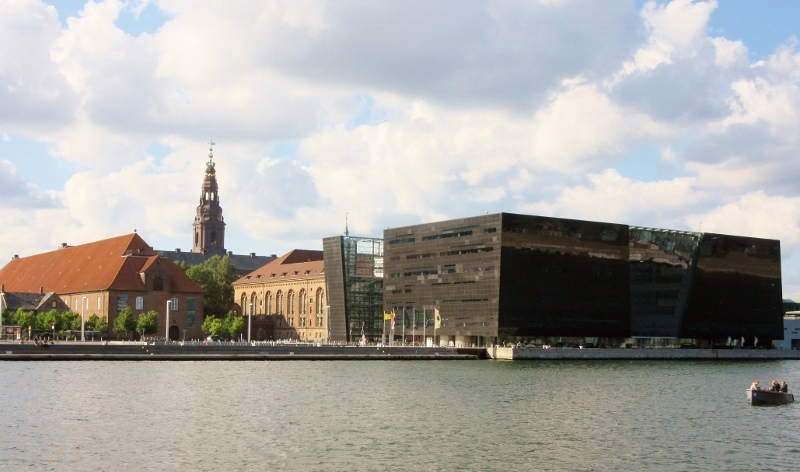 🙂 So glad our post reminded you of your visit and maybe we’ll all figure out a way to return again (on the cheap) to spend more time in Copenhagen as well as explore some of the rest of Denmark. The way you describe the weather and the bicycle lanes, Copenhagen sounds a lot like Holland, where I live. When I was there I looked up the antique/junk stores outside of the center and had a great time searching for Royal Copenhagen china to complete the set I inherited from my mother. The junk shops had some amazing Danish modern furniture as well, really cheap. Unfortunately I couldn’t buy any to take home for lack of room! We’re looking forward to visiting Holland so that we can compare the countries! We used to love to visit antique stores back in our former lives as collectors and I think poking around the antique stores of Denmark would be incredibly interesting as well as fun. Even shopping for day-to-day necessities is a small adventure for us (right now we’re on a quest for door stops) as we never know what or where we’ll stumble over something unexpected. I used to hate shopping before we started traveling but since we’ve started traveling it can be quite entertaining! I love the way you can get away with interjecting a lot of facts without losing the interest of the general reader. 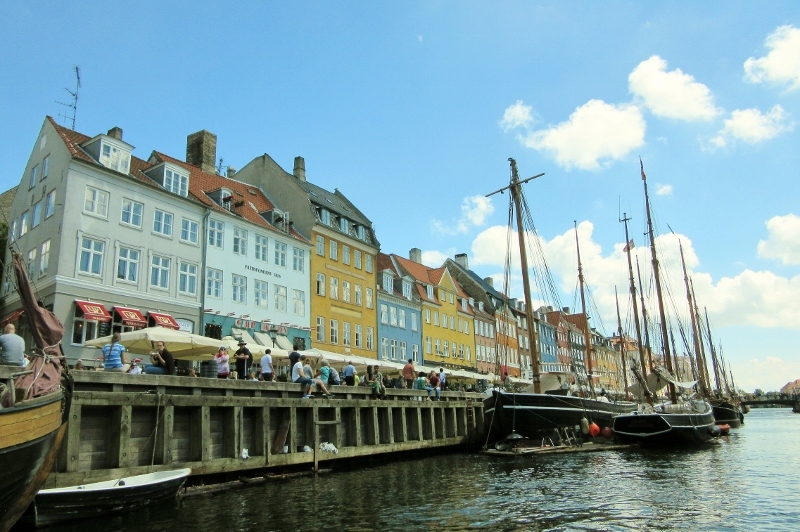 But I was waiting for your impression of Nyhavn, which is the one place we equated to happiness in Copenhagen after the Happy Denmark sign downtown! But loved the Marble Palace and Opera House, too….and lingered in the 4-Palace Square! Four hours on a bus to get to an airport does not sit well with us for a base though. We’re glad we can make some of the history as interesting for others as we find it although we might have lost some readers if we’d continued on much longer! 🙂 And we decided that Nyhavn is such a “wow” area it will have to have its own mention in a future post! As for the distances in traveling from place to place … Remember we lived in south Texas for 10 years and spent a lot of years prior to that in Montana so 4 hours on a bus (with Wi-Fi) isn’t too bad in comparison! 🙂 You’ll find when you stay in Albufeira next year that the Faro airport is less that half an hour away (about 50 minutes for us) and has direct flights to Lisbon as well as many other countries. We’ve found though, when we factor in the commute time there, the lines and security plus any layover, it’s about the same in time and less hassle worrying about parking fees! I think that 4 hour bus ride would drive me nuts (I hate riding buses) but you had such a great opportunity. I laughed when I read about your dark socks as eye masks during Summer Solstice. But it worked! 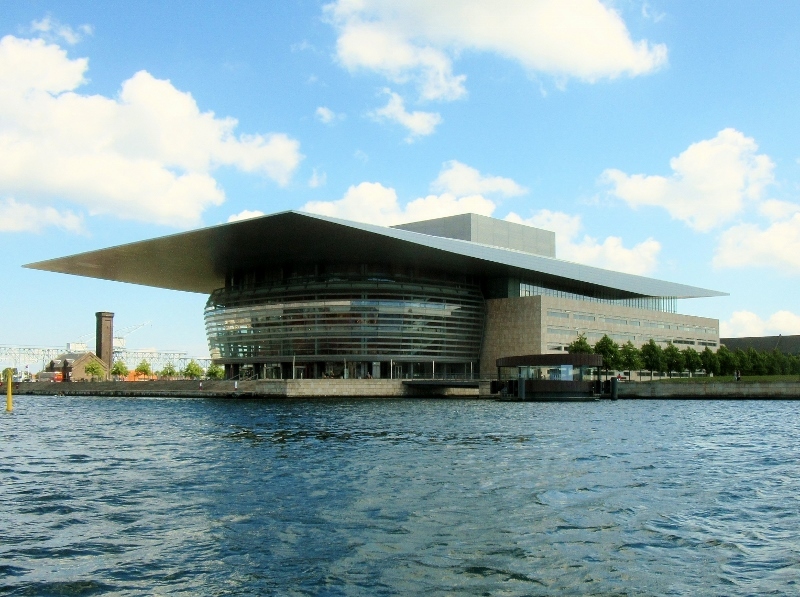 Love the architecture in Copenhagen! Somewhere along one of the roads in Central America a few years ago we ditched the eye masks and earplugs as non-essential and you’d be surprised at how well dark socks work in a pinch (as long as you’re flat on your back anyway!) Long bus trips aren’t any fun but at 20 €/day for parking fees in many places using the convenient public transportation is much more affordable and the 36 € for a roundntrip ticket to Lisbon is another great incentive. But maybe, in the future, we’ll bring along more socks for seat padding! I had just announced yesterday, “We need to get that visa and live there for a year full-time so we could hop a plane and go to these places like we’ve been talking about doing”. I can assure you this post will be required reading for The Scout – another on our list of why to get started on the resident visa! I am still in awe of the ease of travel and closeness of countries on that side of the pond! Fun introduction to this city, you’ve given us! We couldn’t agree more Jackie that our residency visa in Portugal has opened up the ease of travel to other European countries as well as greatly decreased the expense. And it’s no harder to drive or fly between countries in the Schengen area than it is to travel between states in the US. All great reasons for you to live in your stone house as long as you want to rather than doing the 90 day in-90 day out tango! We have started the process. Had planned to do so in spring before our unplanned early return to the States. Our attorney is looking into what we need to bring with us this fall and I am using your information page as a reference point! I really wanted to hear about the electrification of the city! 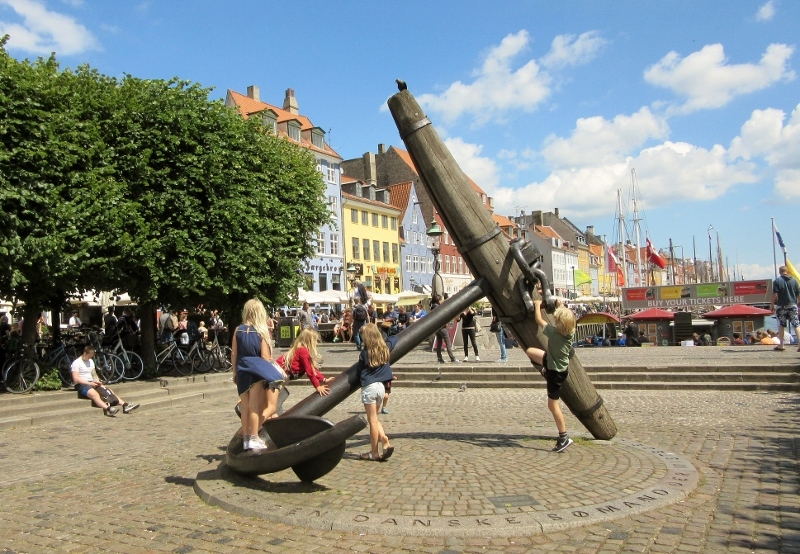 Copenhagen looks delightful – how nice to be somewhere people are happy and not in a state of turmoil. I’m finally going to get to visit next month so thanks for the good ideas of things to see and places to check out. I think we can promise Kay, that Copenhagen will put a smile on your face and go so far to predict that you’ll fall in love with it. We’ll be writing more about what we saw and did while we were there but I think your biggest problem might be winnowing your list of must dos/must sees. And you may well have to fight the urge to overstay your visit! I loved Copenhagen and, like you, was struck by how happy people seemed to be. Perhaps it was something to do with visiting during midsummer! You could be right Karen that our mid-summer visit showed us the best side of Copenhagen with so many people out and about reveling in the warmer weather and taking advantage of the sun between intermittent rain showers. There was definitely a “carpe diem” sort of feeling while we were there that I suspect may permeate throughout much of the citizenry’s positive outlook on life. And, as we said, we’re hoping it’s contagious! Lucky you two. I have been to Denmark and it is a great travelers dream. You are FAMOUS now. I have received a note from Google to visit your blog. Certainly, it is time to consider the book,”A free Spirited Travelers Journey.” So happy for you. What beautiful photos, I love the one of the harbour side with the wooden sailing boats and the brightly coloured buildings: that ticks all my boxes 🙂 I went to Copenhagen in the winter so I saw a very different side to the city, it was covered in snow so nobody swimming in the water then! 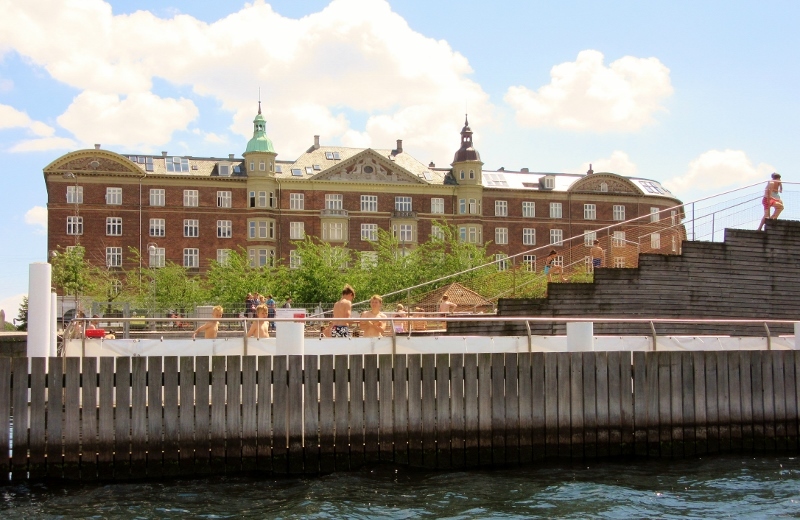 Thank you – Copenhagen’s a city that begs for a camera! After years spent living in Montana we generally shy away from any place where we might encounter snow but it would be interesting to see what the overall “vibe” would be when the days are much shorter. Our impression is that however short the days are, the residents of Copenhagen just enjoy their city. And they take full advantage of summer days while they can! I like your subtle description and those beautiful photos of Copenhagen, especially those lines of colourful architecture. Glad that you had a wonderful journey there. Aw, the architecture! Makes us wish we’d learned more about the different styles years earlier but there’s no time like the present to start and Copenhagen would be a great model to study. What we thought was so interesting was that all the different styles contrasted and yet complimented each other to show off their unique styles. What a great city to visit and your post is very interesting and informative. You can see why this city would top the list of most liveable and happy city to live. 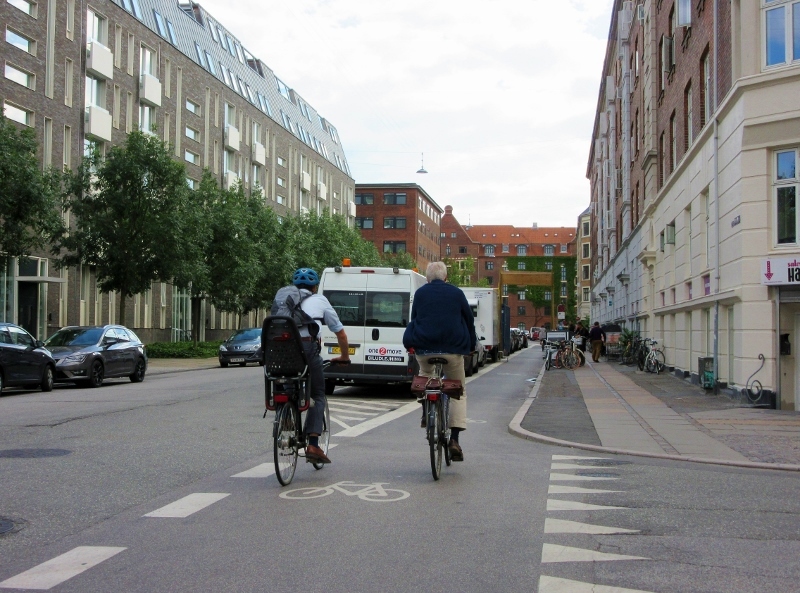 I love the mix of architecture styles and that so many people use bicycles to get around, it sounds like the bicycle lanes make it very easy and safe. I am glad you had such a lovely time and I hope to visit Copenhagen soon. Copenhagen really is a unique city and we found it to be so appealing without the traffic jams and stressed out faces that you usually see in big cities. Just a terrific place to visit all around with a very walkable historic area and sights to see whatever direction you looked. This is one city I could visit time and time again and not get tired of! What a thoroughly delightful account of Copenhagen. It reminds me very much of Stockholm in the summer. Also the bikes remind me of Holland, and the bike lanes are just the same as those in Vancouver. Thanks Alison! As you may have noticed 😉 we totally loved seeing the bike super highways in action throughout Copenhagen and everyone just seemed to brim over with energy, health and happiness. We are so looking forward to visiting Sweden and many of the other Baltic countries (so many amazing places to choose from!) and Amsterdam, Holland may be on our horizon sooner than we’d hoped. But we must confess with shame – we have yet to visit Vancouver … something we are going to have to correct soon! 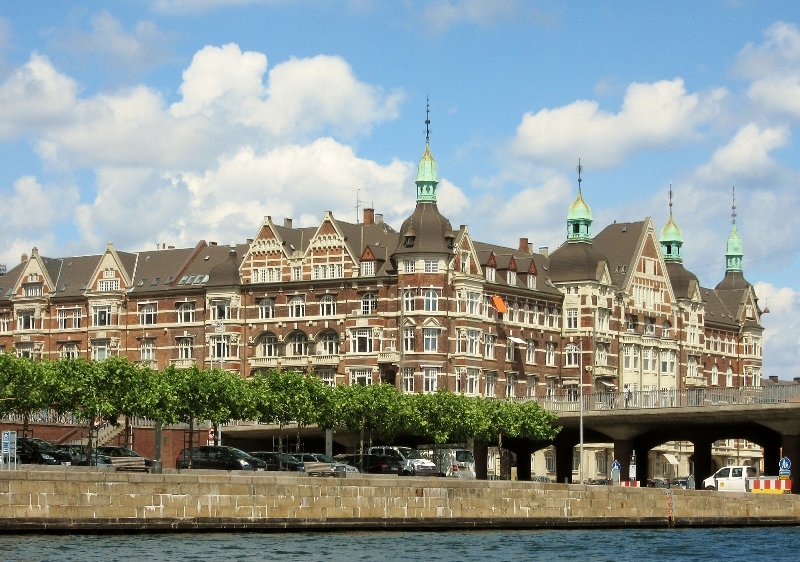 Copenhagen has long been on our bucket list. Hopefully it will fit into the budget one day soon. Your narrative and photos are wonderful. Ha! That’s the big question LuAnn. For us, we started out in Mexico in 2012 with very few plans or timelines and just the vague idea that we would move south. We love the way short term planning (usually no more than 3 months ahead) has allowed us to grab opportunities and also let us zig or zag as our current interests lead us. All you need is a starting point and then …. who know where you’ll end up? Great LuAnn! We’re still as enthusiastic about travel and living abroad as when we started four years ago! This has been such an awesome adventure and (we keep repeating it but it’s true) our list of places to go grows longer every year! It’s great to hear that your enthusiasm is just as great as when you began this journey. I’m afraid a lifetime will not give us enough time to see all we have on our list. Ha ha – us too. And that includes your terrific blog! Fun Fun for you both. Hope you enjoyed it as much as the anticipation of going. Looking forward to seeing you when we see you. Take care and hope life is good! Copenhagen was totally fun Steve and you would have been grinning away clicking picture after picture (think castles, people and Tivoli Gardens!) And your comment about the anticipation of a journey is something we agree with wholeheartedly as it adds so a lot of seasoning to however long the planning stage is! Life would be so boring if we couldn’t look forward to new experiences (in our own backyard and afar) as well as learning new things. Here’s to seeing you and Marti when you get to “our” continent! 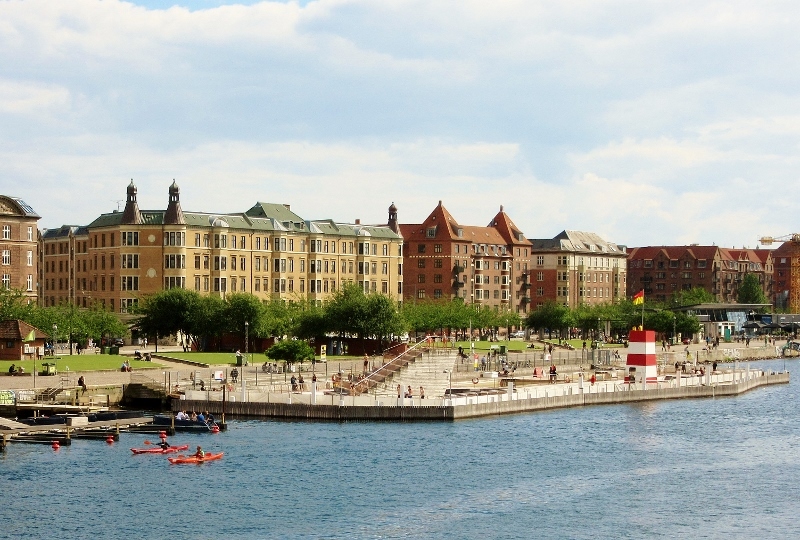 Love this overview of Copenhagen. It looks like a great city to visit – full of happy life. Maybe someday my budget will allow me to visit. I am glad to see you are enjoying Copehagen – tongue twisters notwithstanding 🙂 The last four years, before I came to Spain, I was living on the other side of the Oresund bridge – in southern Sweden and visited Copenhagen often – it has this friendly vibe, everybody is talking about, good, though usually fattening, food (have you tried smoerrebroed? one of my favorite is Veterinarian’s Night Sandwich: a thick slice of pate, crispy fried onions and tranberry jam on a piece of rye bread, all of it covered with a big slice of ham, ha ha ) and, of cause, Noma, one of the best restaurants in the world plus Louisiana, one of my favorite art museums in the world. Enjoy! The Danish language had us confused and tripping over our tongues many times as we stumbled over a few basic words and the place names were no different! We did try a version of the smoerrebroed – the bread was incredible and your sandwich, the Veterinarian’s Night Sandwich, sounds appetizing too. Coming from the United States with its vast distances, it never fails to astound us that the countries in Europe are so close together. 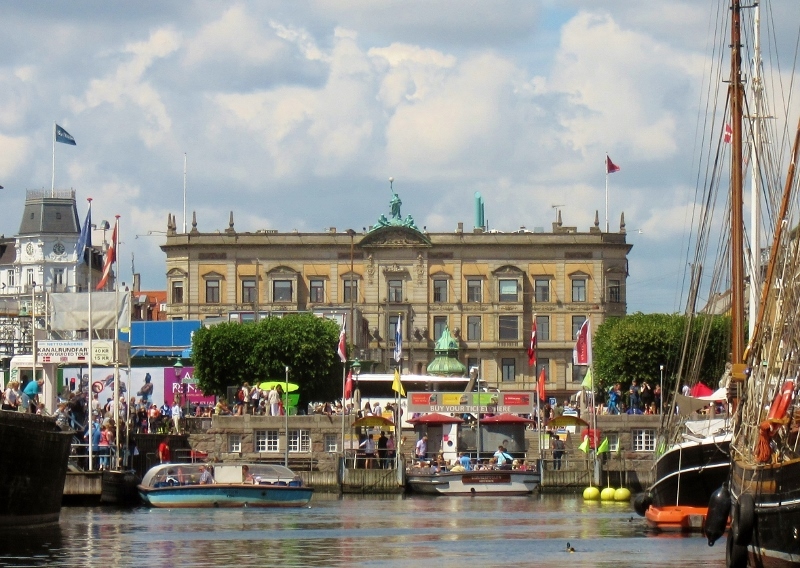 We love the idea of being able to go back and forth between Sweden and Denmark as often as you’d like! Great opportunity for you! Alas, soooo many countries, so little time. But now that you’re based over there, easy to pop in to see all of that corner of the globe. I’ll be headed a bit south of there come September (Munich) but then skipping south through the Balkans/Turkey, so just can’t squeeze Denmark into this trip, but you make it look fabulous – enjoy! “So many countries…” We’re singing your song, Dyanne! Sounds like your upcoming itinerary is ambitious as well as adventurous and we can’t wait to read about your experiences. One of these days our travels are going to intersect in some exotic place and we’re looking forward to sharing some stories and laughs! Stockholm was so close and yet so far … 🙂 We’ll figure our a way to get there yet and still get our (beauty) sleep. Officially the sun rises at 04:30 but we know that the unwelcome light was intruding on our zees a lot earlier! Considering that summer is the high season it’s easy now to understand why many of the moderately priced hotels wouldn’t have windows. And as a visitor, who wants to spend much time in a hotel anyway when there are so many awesome places to see? Copenhagen is still on my bucket list but the fierce cost always puts me off. I went to Norway 5 years ago and am still paying down the credit card bills! We’re laughing at your comment, Andrew because that’s exactly how we felt! However, we’ve learned over the years that there are various ways to scratch our travel itch while containing costs and of course we don’t hesitate to grab opportunities whenever they present themselves. It’s always amazing to us that many of the things we enjoy are free and low cost (luckily we’re not “foodies”) and we’ll continue to juggle more expensive places with “budget” destinations. All-in-all, a rich and wonderful variety of experiences! I am forever thankful for ‘low cost’ airlines and how they have made travel more affordable. Us too! 🙂 And with some of the online web sites like SkyScanner and travelzoo we have a lot of options to look for travel destinations at the best prices. Makes fantasizing about future destinations more of a possibility!